Renewable energy installations aren’t just for futuristic metropolises; they’re also useful in even the tiniest remote villages. Take Tocco, for example — the 2,700-person Italian town has installed four wind turbines that create 30% more power than it uses. The town has profited handsomely from its installations — Tocco generated $200,000 from wind turbines last year, allowing it to scrap local taxes and garbage pickup fees. The small town even has cash leftover to triple its street cleaning budget and retrofit the local school for earthquake protection. Tocco’s turbine success has inspired the town’s residents to implement renewable energy projects of their own. The town cemetery’s office is now lit with a solar panel installation that saves $2,000 each year, and wealthy local residents are increasingly turning to rooftop solar panels to generate electricity. 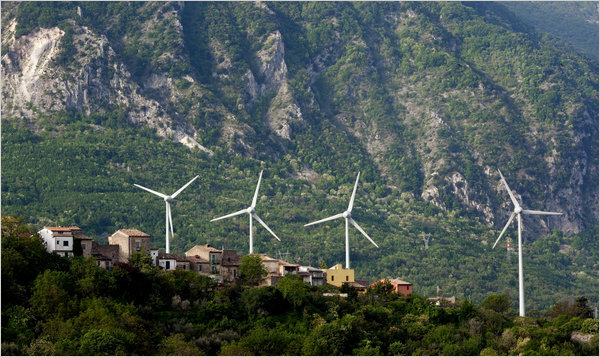 But while Tocco may be a model of small town renewable energy, Italy has a long way to go. Only 7% of the country‘s power comes from renewables — a far cry from Tocco’s renewable stronghold. Renewable energy installations aren't just for futuristic metropolises; they're also useful in even the tiniest remote villages. Take Tocco, for example -- the 2,700-person Italian town has installed four wind turbines that create 30% more power than it uses. The town has profited handsomely from its installations -- Tocco generated $200,000 from wind turbines last year, allowing it to scrap local taxes and garbage pickup fees. The small town even has cash leftover to triple its street cleaning budget and retrofit the local school for earthquake protection.